Dr. Kurt Newman visits with 14-year-old Jack Pessaud, who's undergoing treatment for a cancerous tumor in his knee at Children's National Health System in Washington, D.C.
Before becoming president and CEO of Children's National, Newman was a surgeon at the hospital. 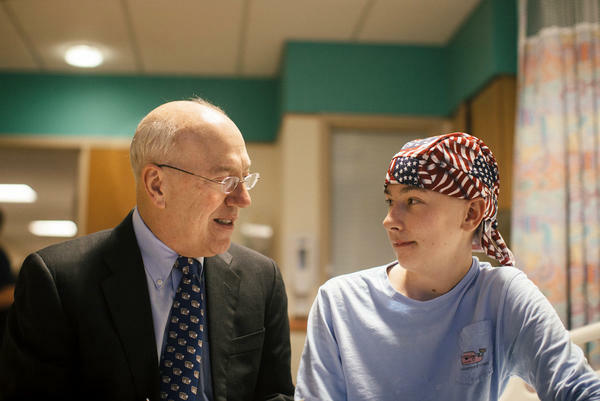 In his memoir, Healing Children: A Surgeon's Stories From The Frontiers Of Pediatric Medicine, he argues that children are not just smaller, softer adults, and that the differences matter for their treatment. Medically speaking, how are children distinct from adults? It starts with size. In some cases, you need special equipment, or you might need special medications that work differently on children. Their biology is different. They're more resilient. They bounce back. They heal better. And then there's a whole idea about development — for example, the developing brain. You have to think about how that brain is now, and how it's going to develop, and what should we do now so that we maximize the potential for that child. When you think about a child, they need protection. They're not fully formed or fully mature. Their organs are not what they're going to be. But at the same time, that immaturity allows so much bounce back and so much healing and so much ability. So you have to take both those things into mind as you take care of a child. What changes do you want to see in health care for children? Over half of the children we take care of are on Medicaid. And as I look at the debates in Congress and in Washington, I worry because I'm not sure that children are enough of a national priority for us. I would really prioritize how we care for children. I'd make sure that we're training more doctors [and] more nurses that are specialized in pediatric care. I'd do more research into the causes of some of the diseases that we take care of, to try to prevent them or diagnose them early. I'd put a lot more into mental and behavioral health. Over 20 percent of the kids have some sort of mental health or behavioral health issues. And I'd probably build a few more children's hospitals. At a children's hospital, you know you're going to get care that's focused exclusively on children, and there's a priceless value to that. If your child is undergoing anesthesia, you want to make sure that the person putting your child to sleep is trained in pediatrics. Or if you go to an emergency department — our emergency department sees 150 kids a day. So why go to an emergency department where they may only see five or 10 kids a day? They may not even have the equipment that's needed. I want to empower parents with this book to understand what I know — the special value of children's hospitals and pediatric specialists. Over the years, there must be patients you haven't been able to help. That's part of the inspiration of the job, to think about the children we couldn't do enough for. In surgery, I would try and create a professional distance, but there's one I think about all the time. His name was Casey. We called him "the Mayor." He had this infectious gregariousness. He was always more interested in how the other patients were doing, or how I was doing. I had to operate on him a number of times. He had a bone tumor that was discovered [when] he was playing soccer. He kept wanting to get the next surgery or get the next chemotherapy, because he had this sense that there was something more out there. I think in a way, he wanted that for other kids. We want to do more for kids, and there are so many exciting discoveries. The frontier of pediatric medicine is so alive with new ideas and innovation. That's what drives us — kids like Casey — so we can do more. Weekend Edition editor Jordana Hochman contributed to this story. The thought of their child being seriously sick can stop the heart of a parent. If that happens, it's good to know there are doctors like Kurt Newman. KURT NEWMAN: Hey, how are you? 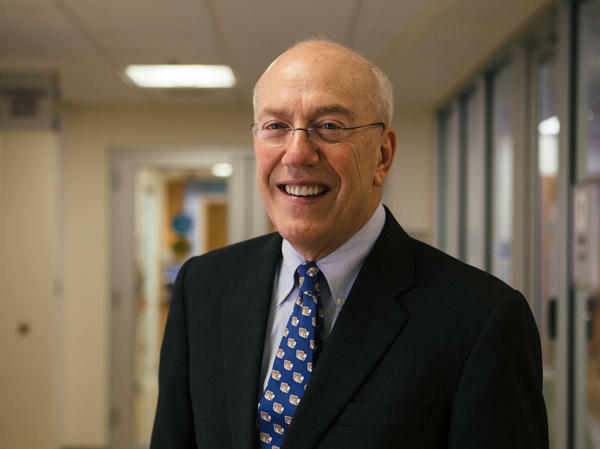 SIMON: He's president and CEO of Children's National Health System, the hospital known as Children's National in Washington, D.C. Dr. Newman doesn't have a corner office with commanding views. Instead, he's in a windowless room in the heart of the hospital where he hears carts rolling and staff members coming and going. NEWMAN: You know, when I hear swinging doors, it's almost like hearing that monitor beeping and the pulse going. It's just like there's something happening. If it were dead quiet here, I'd be really worried. SIMON: Dr. Newman came to Children's National as a surgeon. He spent more than 30 years trying to care for children who suffer from injuries and illnesses like 14-year-old Jack Pessaud. SIMON: Jack is a bright young man who loves science and math. He thinks he might like to be a doctor. He's seen a lot of doctors in the past few months. He'd had pains in his knee when he ran. And tests determined it's osteosarcoma, a cancerous tumor in the bone. PESSAUD: One of the chemo drugs is doxorubicin. PESSAUD: And I only get it for about 15 minutes when I come in. But it's red. And I always want to get it when my friends come in because it freaks all of them out. NEWMAN: You can tell why I'm holding a slot for him on our medical staff. SIMON: Back in his office, Dr. Newman explained that children are not just smaller, softer adults. Childhood illness has its own challenges and rewards, which he explains in a new book "Healing Children." NEWMAN: Well, it starts with, obviously, size in some cases. You need special equipment. Or you might need special medications that work differently on children. Their biology is different. SIMON: Are children both more vulnerable and more resilient than adults? NEWMAN: You know, when you think about a child, they need protection. They're not fully formed or fully mature. Their organs are not what they're going to be. But at the same time, that immaturity allows so much bounce back and so much healing and so much ability. So you have to take both those things into mind as you take care of a child. SIMON: Yeah. What made you decide to go from being a surgeon, hands-on doctor to being an administrator? NEWMAN: You know, I miss surgery. I miss taking care of patients and families. But I love the idea and the opportunity to have a bigger impact on a hospital. And my big idea was that having a doctor as the CEO and a nurse as a chief operating officer, a nurse as our chief legal officer that we put the doctors and nurses at the top and put the patients and families in the center. And if we did that and we did the right things for patients and families, that the finances would follow. Instead of trying to serve the business and the finances, we wanted to serve the patients and the families and have it diffuse out so that patients would know this is a hospital that's all about children. SIMON: And yet, if you don't have the money coming in, you're not able to produce the medicine, right? NEWMAN: That's right, and it's tough. Over half of the children we take care of are on Medicaid. And as I look at the debates in Congress and in Washington, I worry because I'm not sure that children are enough of a national priority for us. In the conversation, I don't hear a lot about children and access to care and their health needs, the research needs. Over 50 percent of the children in this country are on some type of government insurance or Medicaid, but that's not in the conversation. SIMON: What would you do? NEWMAN: I would really prioritize how we care for children. I'd make sure that we're training more doctors, more nurses that are specialized in pediatric care. I'd do more research into the causes of some of the diseases that we take care of to try and prevent them or diagnose them early. I'd put a lot more into mental and behavioral health. Over 20 percent of the kids have some sort of mental health or behavioral health issues. And I'd probably build a few more children's hospitals. SIMON: Yeah. I think we can't interview somebody who is a world renowned expert on pediatric medicine without asking the obvious. There must be patients, over the years, you haven't been able to help whose memory weighs on you? NEWMAN: That's part of the inspiration of the job is to think about the children we couldn't do enough for. You know, in surgery, I would try and create a professional distance, but there's one I think about all the time. His name was Casey. We called him the mayor. He had this infectious gregariousness. He was always more interested in how the other patients were doing or how I was doing. He'd always ask me, you know, how are you feeling? And he worried about me. And I had to operate on him a number of times. He had a bone tumor that was discovered. He was playing soccer, but he had gotten very - because he was a soccer player, the local women's soccer team had gotten very interested. And they would come visit him. I remember Mia Hamm came to visit him. And they were all at his funeral. He had that kind of impact on the whole institution but certainly on me. SIMON: And the world lost Casey, but his story continues to drive you and inspire you? NEWMAN: Casey's story is one of those things when I feel a little down about where we are, and I just think about his relentless optimism. There are so many exciting discoveries. The frontier of pediatric medicine is so alive with new ideas and innovation that that's what drives us - kids like Casey - so we can do more. SIMON: Dr. Kurt Newman, his book "Healing Children: A Surgeon's Stories From The Frontiers Of Pediatric Medicine." (SOUNDBITE OF EL TEN ELEVEN SONG, "FANSHAWE") Transcript provided by NPR, Copyright NPR.